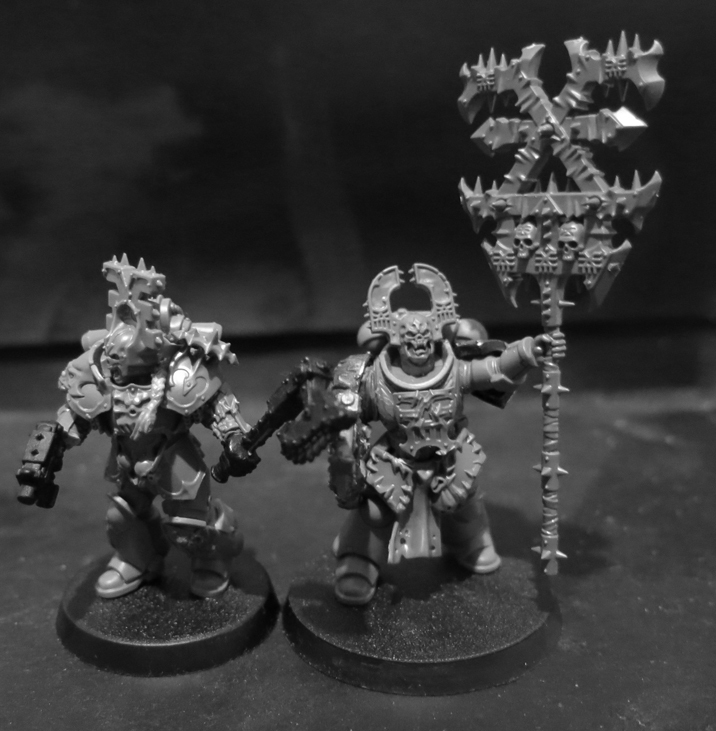 So the Age of Sigmar rumbles on and, following on from the release of the God-Kings golden warriors – which proved a little bland to my taste after a while, we now see the opposition; the legions of the Blood God. Because I thought this merited talking about a little I decided to chap on and get a model painted so I’d have something of my own to show off as well. Of course as my own worship of the Dark Gods is rooted firmly in the 41st Millennium this berserker wears power armour instead of leather and iron plate. I turned his bolt pistol into a net launcher as I reckon this would be a pretty handy weapon for a berserker to have. 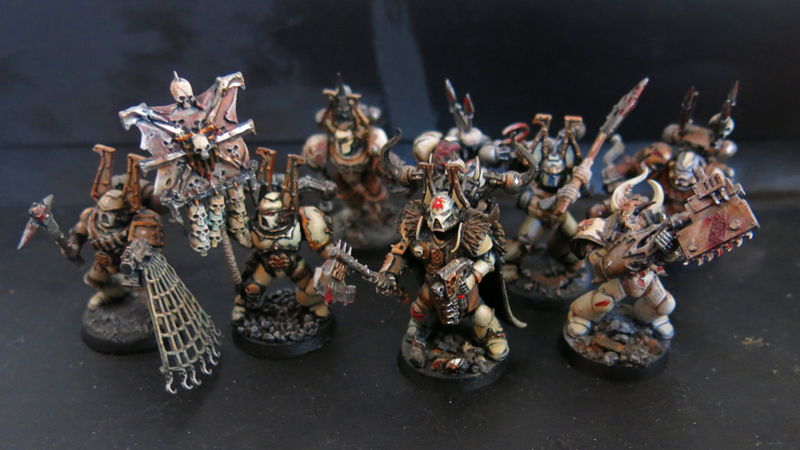 Khorne, after all, isn’t the type to deliberately handicap his warriors with too many rules. Perfection and precision is more Slaanesh’s department, Khorne – as we are reminded ad nauseam – cares only that the blood flows. Thus although snaring your opponent in a net is not the most honourable way to go about things if it helps you lay bigger and more impressive skulls at the foot of his throne then so be it. He also has a fairly low opinion of enemies who run away so the ability to snare some panicking troops and drag them into reach is likely to be interpreted approvingly. It also adds a little gladiatorial element which plays to one of Khorne’s key themes nicely. Yesterday we also saw the arrival of the Exalted Deathbringer and what a beast of a model it is. This is one of those models I loved from the moment I saw it and will undoubtedly pick up at some point (remind me of that in three years when it’s never put in an appearance here!). Many commenters have said he’d make a fine Abaddon proxy but I have to say I don’t see it myself. 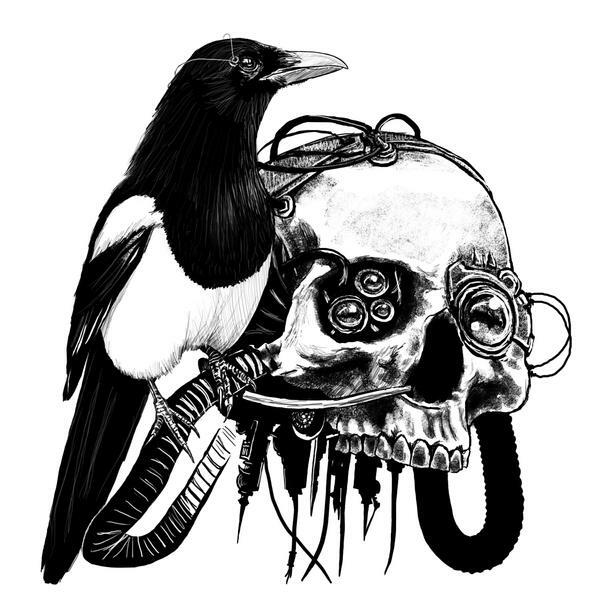 The topknot and the talon are the only aspects which distinctly convey the character of the master of the Black Legion and whilst the former certainly works the latter is a little small to be the legendary Talon of Horus. That’s not to do it down – it certainly looks brutal enough as weapons go, but unless Horus tickled Sanguinius to death this isn’t what he used. Now that axe is another matter. If I was planning to use this model ‘as is’ in Warhammer or Age of Sigmar I’d be spitting bile right now. I know many miniatures companies – GW being one of several culprits – get a bit carried away when it comes to the weapons they arm their models with but this one is particularly silly. How’s he meant to lift that bad boy without putting his back out? And even a warrior of Khorne should consider that he’s hung his skulls in a particularly inconvenient place. Exalted Deathbringer as painted by the clever dudes over at Games Workshop’s ‘eavy Metal team. What if, however, we imagine the model as a basis for a Kharn conversion instead? Suddenly he makes more sense. 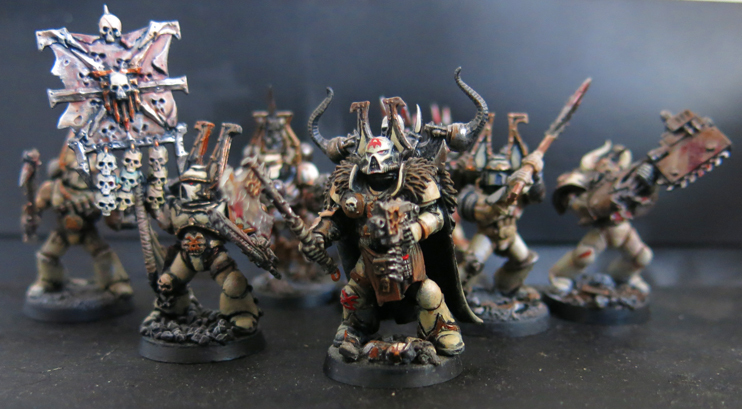 The lower body is already distinctly similar to that of the Betrayer, the symbols of Khorne are already in place and the armour – or lack of it – is far more closely reminiscent of a berserker’s power armour than terminator armour. Best of all, that axe finally looks right. It may be ridiculously outsized for any normal human, or even a Space Marine, but it looks about right for a Primarch (for those not in the know Kharn’s axe Gorechild once belonged to his gene-father Angron). 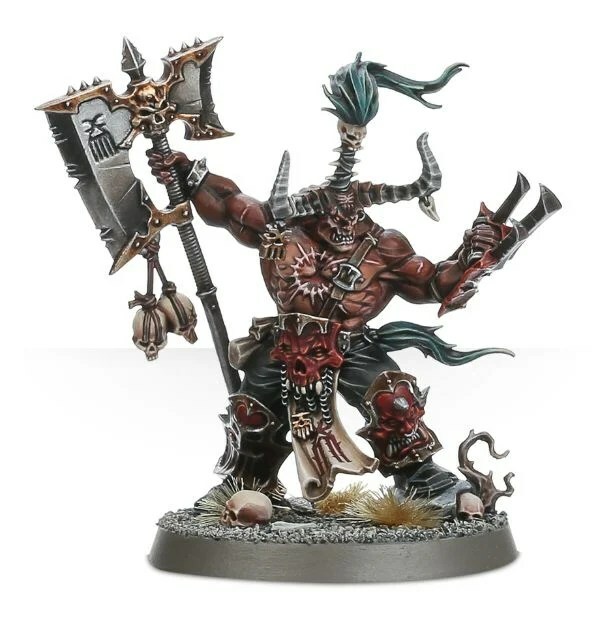 And let’s be honest here, Kharn would be mad enough to lug his father’s axe around even if it was that preposterously large (and tough enough to keep on reaping skulls with it). On a more general note the toplessness of some of the new models is starting to make my life in the 41st Millennium tricky. Nurgle’s followers can bloat and burst through their armour and hardcases like Kharn can rock up to void-combat shirtless but if I want to take advantage of the Blood Reavers then soon half my army will be doing it, which may somewhat dilute the effect. Of course this may just be a sign of a Space Marine-centric world view – after all no-one’s ever bothered that the Catachans forgot to get dressed. Anyway, as usual I’d be glad to hear your comments, both on my own Berserker and the new Deathbringer. Do you hate him? Have any crazy conversion ideas of your own? Planning to use him in old-school Warhammer – and if so as what? Speak your mind in the comments box below.